Three months ago, I wrote an article eulogizing Paul Walker after his unfortunate death. In that article I said that I would hope that anytime a car enthusiast passed, that we eulogize and truly memorialize that person for their contribution not only to our car culture, but for the impact they had on our lives. Well my dear Jalops, it pains me to write this as it is still fresh, but a man I loved and held in deep regard passed this last month, my grandfather Larry. A true Jalop even though I doubt he knew anything about us, but a Jalop nonetheless. As my own personal memorial to him, I would like to share a little of his life with his car and how both touched the lives of a great many people. Not only did he drive it as frequently as he could, but it's also a car that started to pique the interest of one budding Jalop, me, and continues to burn into my mind as a symbol of him and our car culture. 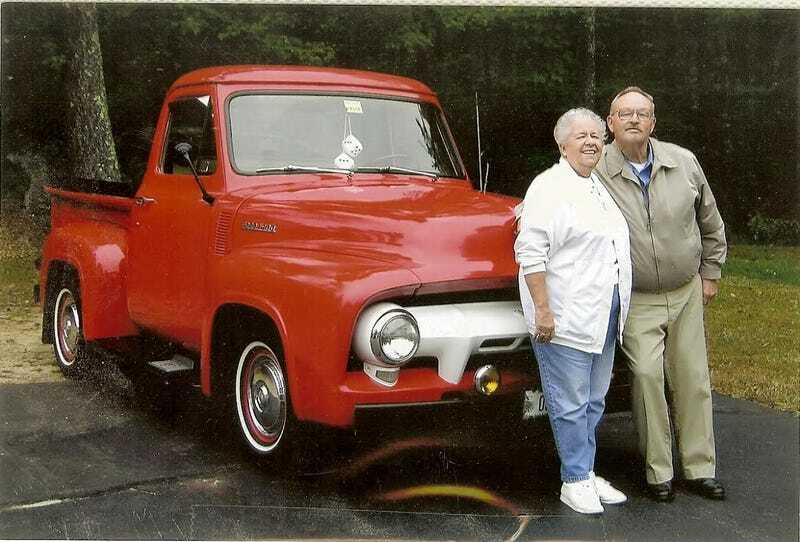 The car in question isn't even a car, it's a truck, a '54 Ford F100 to be exact. It's not fast, it's not loud, but when I think back on my Papa, the image of him explaining why he chose to restore it this way, and going for a ride in it will continue with me forever. He drove it in parades, around the block or really whenever he could start it up, which in Maine was mostly the summer. I just remember when he first had it done and you could still smell the wood planks that became the bed, or when firing her up and you got that great carbureted smell that just tells you, you are in for a treat. The beauty of it just parked in their garage, beckoning for everyone that saw it to come and stare. However, it wasn't only the truck, it was the man behind the truck. Never a gentler soul lived; he would take you into his arms, smelling of Old Spice, and give you the greatest of hugs. I remember one particular occasion, when I was first getting into cars, my cousin Brian and I standing in the garage, the hood up and him describing all the things he had done to it and how all the parts worked. I could tell you that the day was warm and humid, the smell of burnt gasoline hung in the air from us just starting it, and my Papa with the greatest of smiles just explaining all the little stuff to us both. So here are some pictures his beautiful pickup truck so both him and I can share them with all of you and help remember this great man. Papa I'm struggling to find the words to properly send you off as I write this, and honestly I don't think I have the fortitude to continue without breaking down completely, all I can hear in my head is you and that thick Maine accent that telling me "Jonathon it doesn't matter what you write, just know that I love you bub". Papa you will be missed terribly, let us all raise our wrenches and think of all the fellow jalops we've lost.